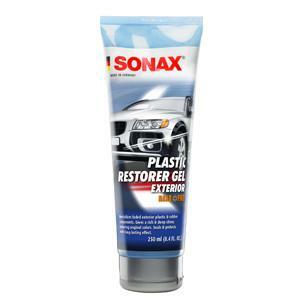 SONAX Plastic Restorer Gel contains Microscopic Nano particles that penetrate deeply into grained and structured surfaces, thereby providing long-lasting protection and long-term conservation. The transparent gel is suitable for all colors; revitalizing bumpers, trim & exterior components, giving them a deep, rich shine. Also ideal for tires & rubber components.